When the weather turns nice, the great outdoors calls, and we’re on the hunt for the best camping gear on Amazon to take advantage of it. Every spring, millions of Americans look forward to hitting the trails and shaking off the doom and gloom of winter. If you’re a Prime user, you’ll also save on shipping costs. You can also get what you need in just two days, sometimes less, just in case you discover some last-minute equipment for your next foray into the woods. One way to plan ahead is through ReserveAmerica. This website helps you plan your next camping trip, whether you’re living high in an RV or setting out with nothing more than a bedroll and a utility knife. The site lists detailed descriptions for federal, state, county, and even private campgrounds across the country. You’ll get maps of the sites plus the utilities provided, along with a list of amenities from fishing to boat rentals to rental cabins and more. Then just place your reservation to ensure that perfect site — just a few yards to the bathhouse — is ready for you when you arrive. There are plenty of great “lists” out there to make sure that you don’t forget stuff you’re going to need. Cozi’s family camping checklist (below) is pretty comprehensive and comes with some great advice, too. There is also a printer-friendly (PDF) checklist here, from REI Coop’s Expert Advice section with essential camping gear information. Once you have a good idea what you need from the checklist, take a look at some of the best camping gear on Amazon to plan for your trip. When it comes to the best camping gear on Amazon, the “essentials” really depend on the type of camping you’re doing. But whether you’re planning to ride in luxury in an RV or doing walkabout with the bare minimums, you should ensure you have the following 10 essentials on you, even if you’re just planning a day trip of hiking. Navigation: a map with protective case and a compass. Get the basic essentials you need for any camping, hiking, or fishing trip from Amazon. One-stop shopping and quick delivery makes it one of the best sources from a wide variety of sellers. That variety also results in some competitive pricing, too. A basic, but precision engineered lightweight compass. 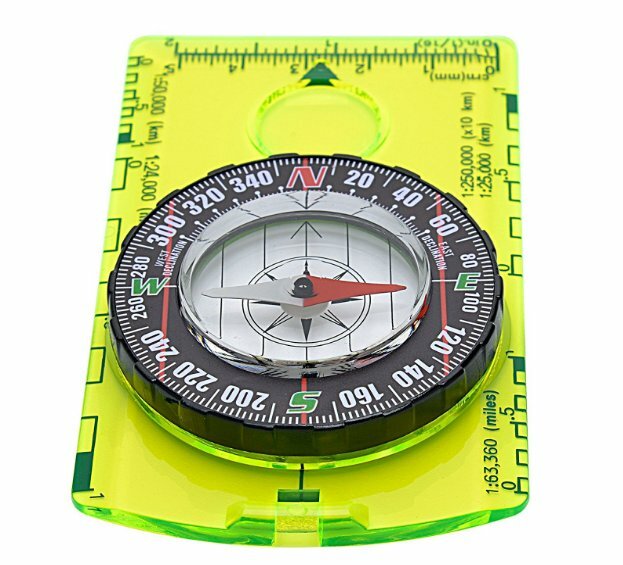 This professional Boy Scout compass is great for orienteering and hiking. The bright green base plate is easy to see and includes a magnifying glass, ruler, and scale for map reading. Bezel adjustment dials in your exact bearing. Simple enough for novices, accurate enough for experts. 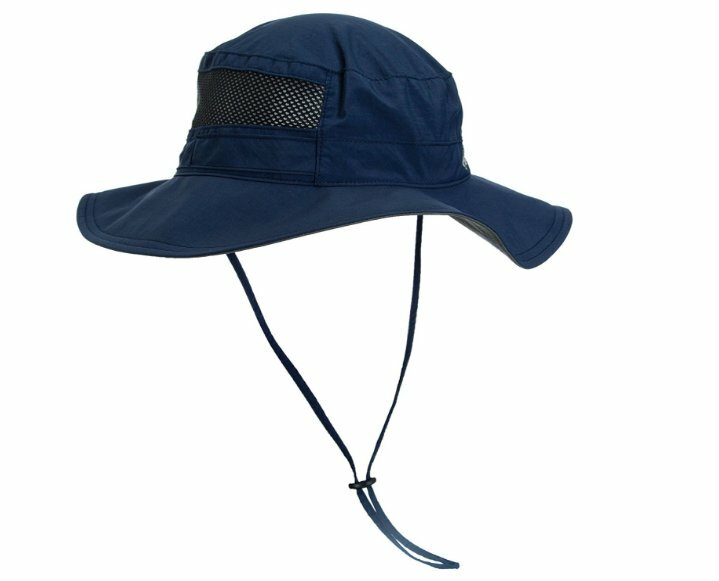 The lightweight Columbia Bora Bora Booney II sun hat provides 50 SPF sun protection to block out 98 percent of harmful rays. It features a mesh vented panel to help you stay cool, along with an Omni-Wick™ sweatband to keep sweat out of your eyes. Toggle band makes this hat a custom fit. The handy 5 by 7-foot Grabber MPI Space all weather blanket folds up small enough to fit in a pocket, but retains up to 80 percent of body heat. Moisture resistant and durable, the bright orange color makes you easy to spot in the woods. The reflective side can be used as a reflector for signaling. 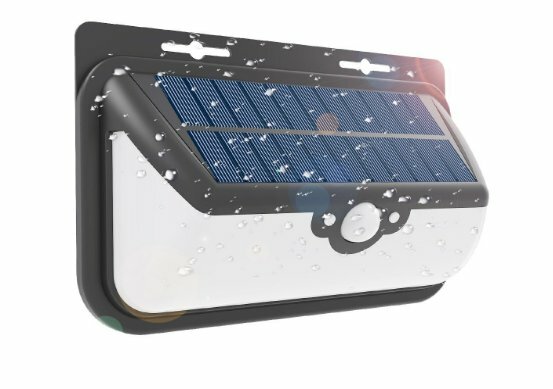 You won’t need batteries with the ThorFire hand crank solar powered rechargeable flashlight. Runs on hand-cranking: Only one minute of cranking delivers one hour of light. It’s waterproof and submersible up to 45 feet. Perfect for camping, fishing, and hiking in any weather conditions. 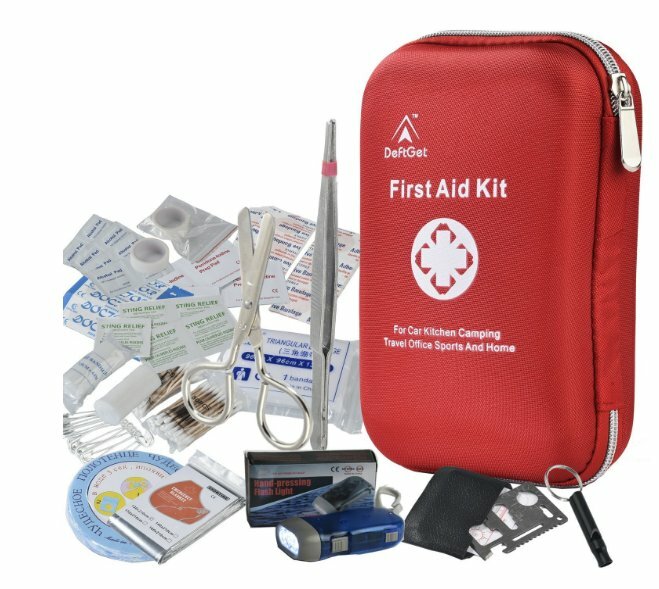 Everything you need for treating minor wounds in the woods, this waterproof first aid kit kid is comprehensive and compact. This magnesium fire starter striker works wet or dry, with up to 15,000 strikes. It’s like a permanent match. The Sahara Sailor Magnesium Fire Starter is lightweight and clips to belt or backpack. The tungsten carbide striker also works as a glass breaker in emergencies. This multi-tool is only 7 inches long but comes with a hammer and hatchet: everything you need to master the wild outdoors. Includes pliers, screwdriver, knife, saw, and more. 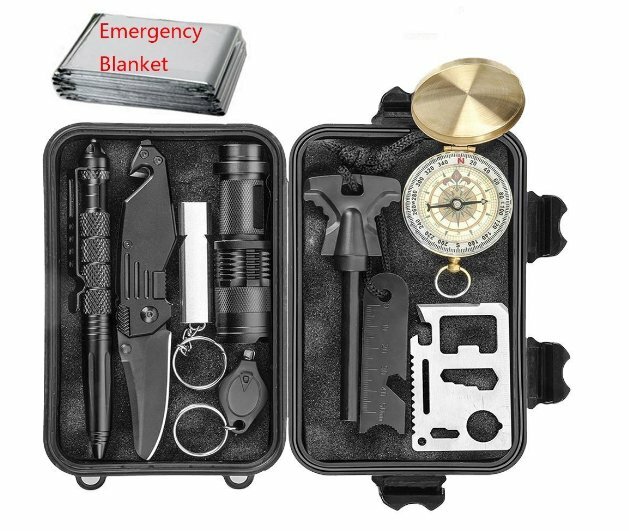 Perfect for primitive camping, with a whole tool box you can tuck away in the included carrying case. Most people can survive a week or even two without food, and some of us perhaps longer. But in an emergency situation, you need to keep your wits about you. 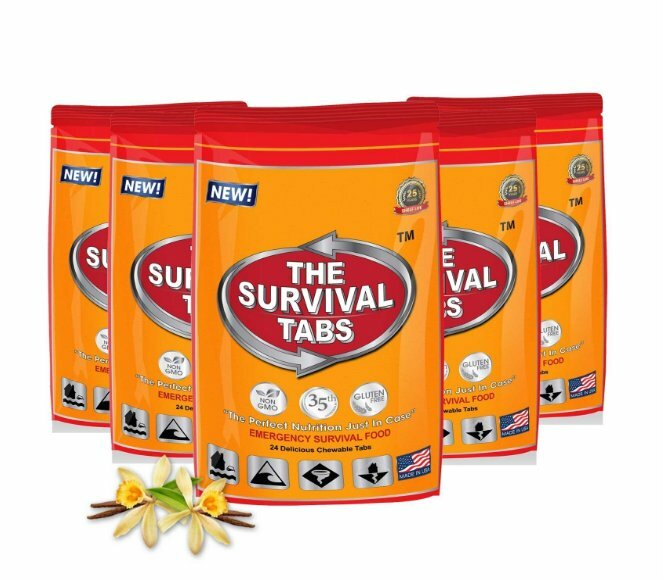 These Survival Tabs supplements contain 100 percent of your required vitamins and minerals, plus 240 calories per serving. This includes enough essential fat, protein, and sugar to keep you going. Most of all, these concentrate tablets are light and easy to pack, with a shelf life of several years. The one thing people can’t live long without is clean water. You’ve probably seen this on the internet and marveled, and now it’s here! 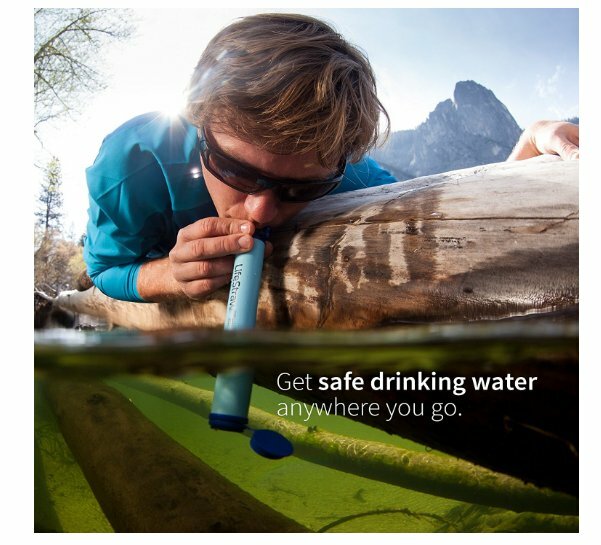 The LifeStraw personal filter straw lets you drink clear pure water wherever you are. 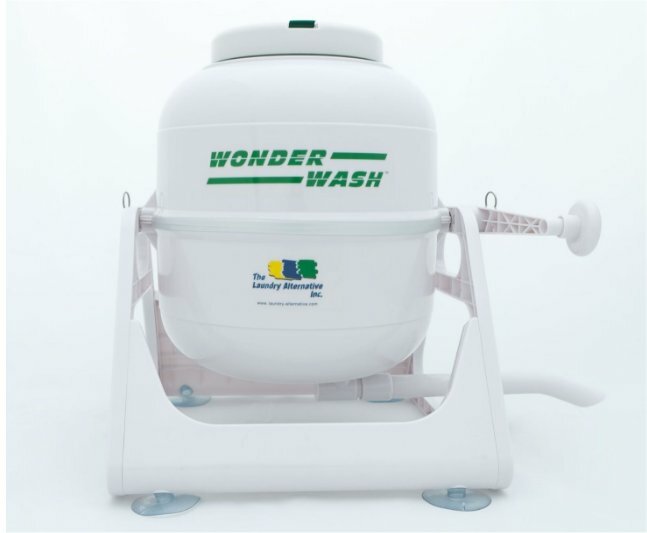 Provides 1,000 liters (792 gallons) of safe drinking water. Removes 99.9999% of bacteria and 99.9% of protozoa. Store indefinitely, even after use. Carry as much water as you need, or you can, but this baby is like a magic wand for clean water. This easy to set up emergency shelter fits two. The thermal Mylar Survival Shack is waterproof and windproof, and it reflects 90 percent of body heat. Tie the included rope between two stable trees or other objects, for a 5-foot by8-foott tent. 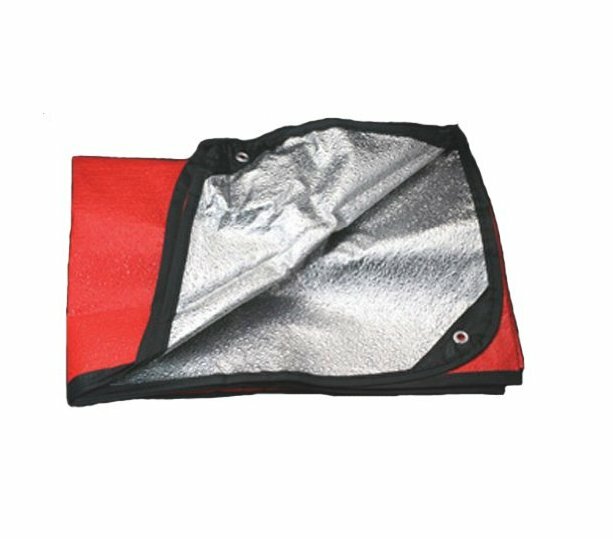 Light to carry and easy to fold up small for packing, this tent can be reused multiple times. Now that you have the basics suitable for the most primitive tent camping, let’s check out a little “glamping.” Family camping trips are a blast, and every family should spend some time away from the stresses of modern life once in a while. There’s nothing like stories told around the campfire, or showing off your survival skill to the sprogs. There are a couple of things to keep in mind if you’re taking the whole family camping. You’ll probably want to stick to established campgrounds with some of the comforts of home. Especially if you’re going to be camping for a few days. You’ll want a campground that has shower and toilet facilities, and perhaps even electric and water service at the site. Taking care of kids is exhausting under the best circumstances, so don’t punish yourself by trying to do it under primitive conditions. Family camping is best done in good weather conditions, too. Don’t drag the 5-year-old out in the middle of winter or out to the desert in August. A family camping trip is not the time to test your personal physical endurance. Just trying to keep everyone and everything dry is enough of a challenge without throwing in extreme heat or cold to boot. Taking the kids, or even the parents, out into the wild means bringing along a lot more to make sure everyone is comfortable. Luckily, there’s camping sets big enough to accommodate your whole family, including cookout equipment and recreational gear. Take a look at the available best camping gear on Amazon that will accommodate everyone in your party. A large family tent can be the best choice for families with small children. If you don’t feel comfortable with your children in separate tents, choose a large cabin tent. Many have inner partitions for privacy. The best camping gear Amazon offers comes from trusted manufacturers like Coleman and Stanley. But there are also great makers creating a buzz for themselves, like the CORE line of tents. 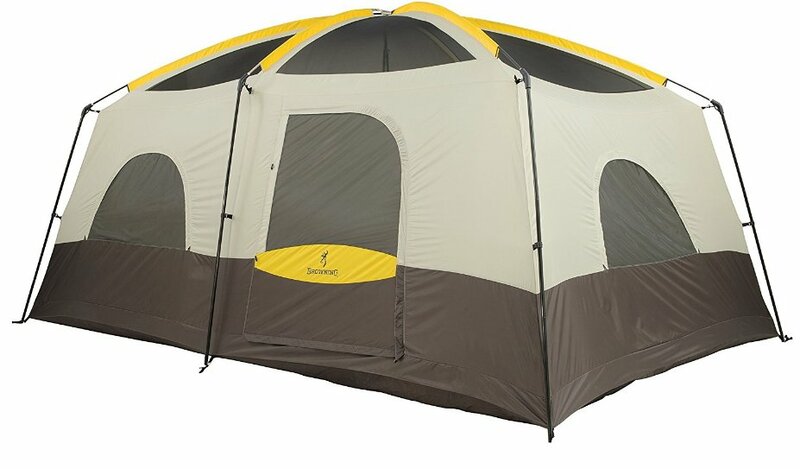 This extra tall Big Horn tent with divider for two rooms is spacious. It has two doors, six windows, and a mesh roof under the rain fly for ventilation. 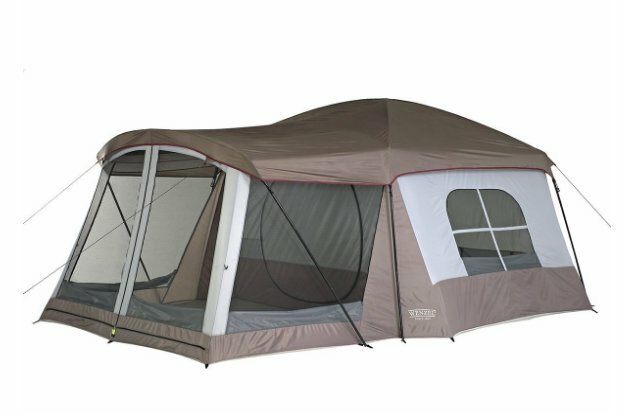 When assembled, this tent is 10 feet long by 15 feet wide, with a center height of 87 inches (7 feet, 3 inches). Comes with fiberglass poles and steel upright for stability. 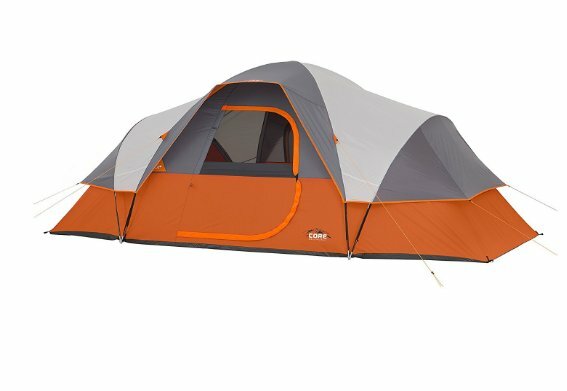 This CORE tent features H2O Block Technology to reduce humidity and keep you and your belongings dry. Has venting to draw cool air in, and mesh ceiling under the rain fly to allow hot air out. 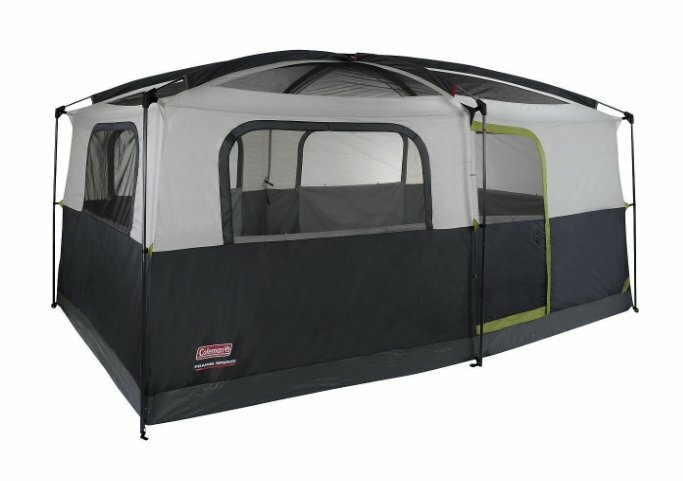 Comes with a “gear loft” net in the tent’s 72-inch center to keep items up and dry. This Coleman cabin tent is a home away from home. It’s a spacious 14 by 10 feet, and 7 feet high at the center. Factory sealed and welded seams block out moisture. Has an LED lighted fan system for ventilation, plus power ports near the floor for electrical cords. Has a divider for two separate rooms for privacy. This Wenzel family tent sleeps up to eight people in sleeping bags and comes with an attached screen room. Sometimes tents can feel a bit claustrophobic. But that’s not a problem with this tent. This fully screen side room lets you sit outside without get rained on or bitten. You can even sleep in it. Has an LED lighted fan system for ventilation. The ten is 16 feet by 11 fee and 6.5 feet high at the center pole. Full mesh room with included rain fly. Even when you’re out in the woods, you want to sleep comfortably. After all, what’s the point of getting out there and ready to play if you can’t get out of bed in the morning? Thankfully, there’s a number of air mattresses and cots on Amazon for a good night’s sleep. 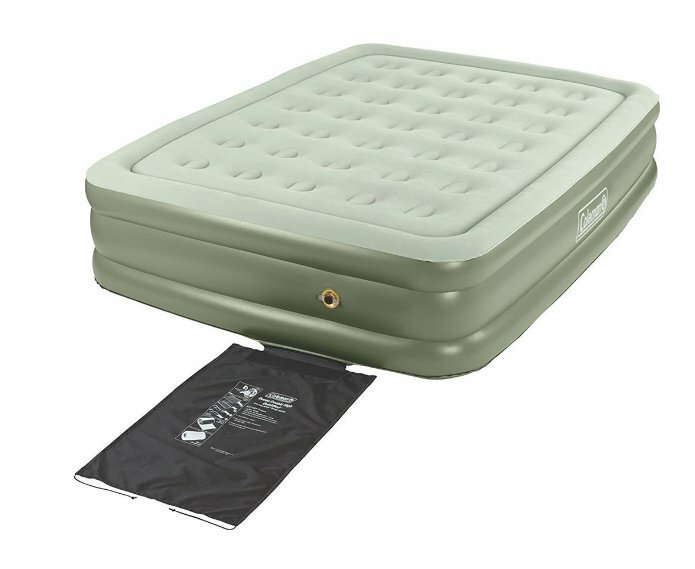 Depending on your age and the state of your back, you may want to consider packing an air mattress during your camping trip. Along with making sleep more comfortable, an air mattress provides a layer of insulation between you and the ground. Even with a ground cover and tent floor, the cold can creep into your sleeping bag and right into your bones. So, it’s a good idea to use some kind of padding between you and the ground. Air is an excellent insulator. An air mattress keeps you off the ground and provides padding for comfort. The type of air mattress you choose depends on your needs and your budget. Older campers may choose a thicker mattress that provides extra padding. More importantly, the extra height makes it easier to rise from bed in the morning. In warmer weather, a simple sleeping bag pad may be adequate. Particularly for those who prefer a less fussy, more rustic camping experience. 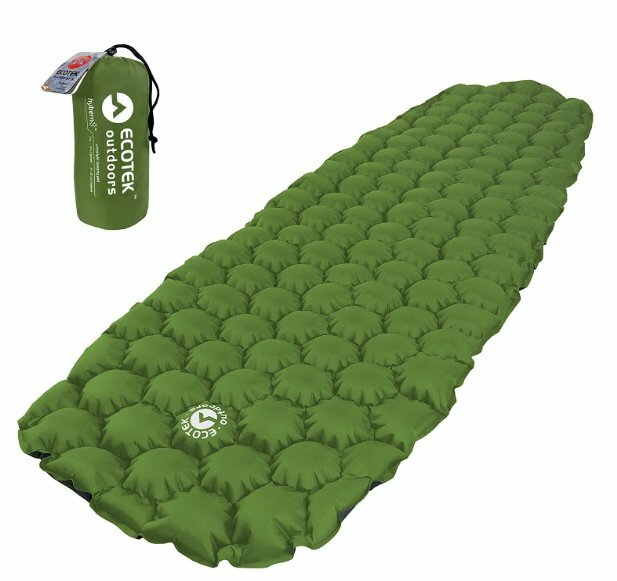 The patent pending design on the EcoTek sleeping pad features a balanced support and better protection from damp. The honeycomb design can be used in hammocks, chairs, or in your sleeping bag. Even better, the unique valve design means it inflates with only 10 to 14 breaths. No need to drag a pump along. Truly all the comforts of home, and perfect for kids! 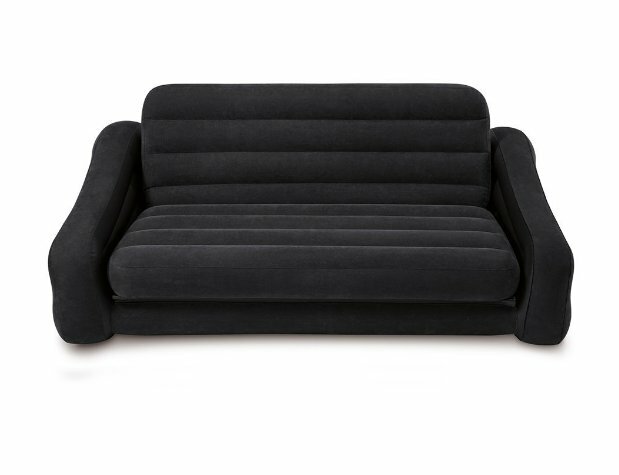 This fold out Intex inflatable sofa bed seats and sleeps two adults. Approximately the same as a queen size, this folds out to 76 by 87 inches. That’ the perfect size for kids to pile on during a camping trip. And if folds away neatly during the day to use for seating. Fresh air and lots of activity means big appetites come dinner time. Many families enjoy cooking out in the woods. And many cooks relish the challenge of cooking on an open flame. Keep the victuals simple, by all means, but don’t be afraid of outdoor cooking. If you’re a newbie, the right equipment makes it as easy as a backyard barbecue. 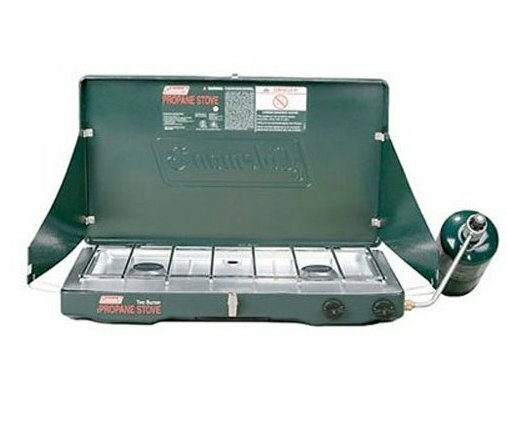 This completely foldable Coleman portable kitchen workspace provides all the space you need to dig in and really cook at your campsite. Space for your camp stove on the side rack (26 by 15), while you stow your cooler underneath. Rack and below rack storage fits most Coleman stoves and coolers. Foods prep area with plenty of room to chop and peel (40 by 20 inches), and even a sink area. Shelving unit under prep area to stow pots and pans and keep them clean. Fold up top features paper towel roll holder, hooks for hanging utensils and wire shelving for condiments and seasonings. America’s essential camp stove. This classic Coleman propane stove has two burners and features wind-blocking panels fora steady flame. Consistent performance and 20,000 BTUs of cooking heat. Burners adjust independently for precise temperatures. Easy to clean and rust-resistant, this cook stove runs on a 16-ounce propane tank for up to an hour. 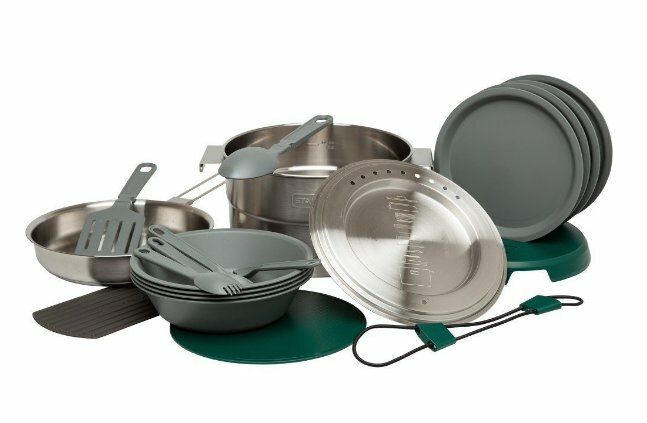 High-quality Stanley camp cooking set and mess kit for four includes pot, pan, plates, utensils, cutting board, and more. Thescratch-resistantt 18/8 stainless steel will never rust and will last for decades. Three-layer frying pan ensures even heating, even over touchy open cook fires. 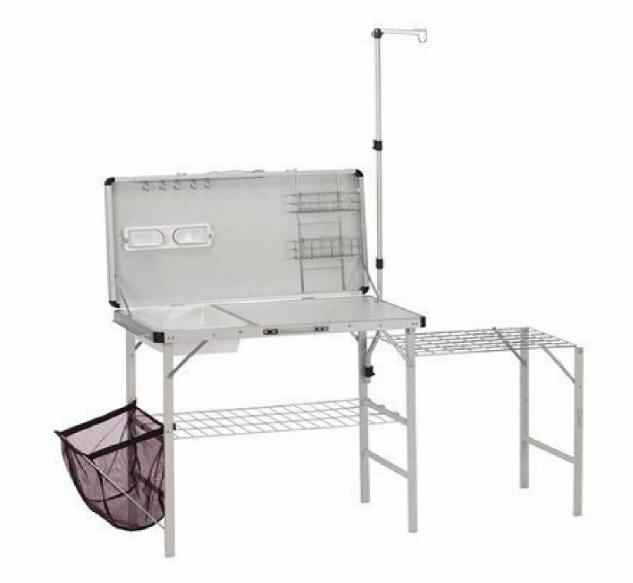 Includes silicone privet and dish drying rack. 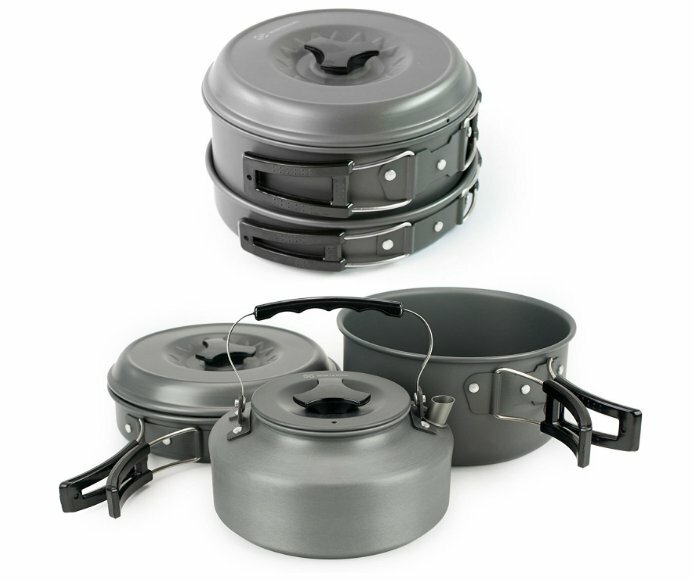 This lightweight and compact camping cookware set from Winterial stores together with folding handles to fit neatly into the net storage bag.Nonstick Teflon makes them easy to clean. Set includes two pots (2 quart, 1 quart) one 6.5 inch frying pat, and a 1 quart tea kettle, plus accessories. 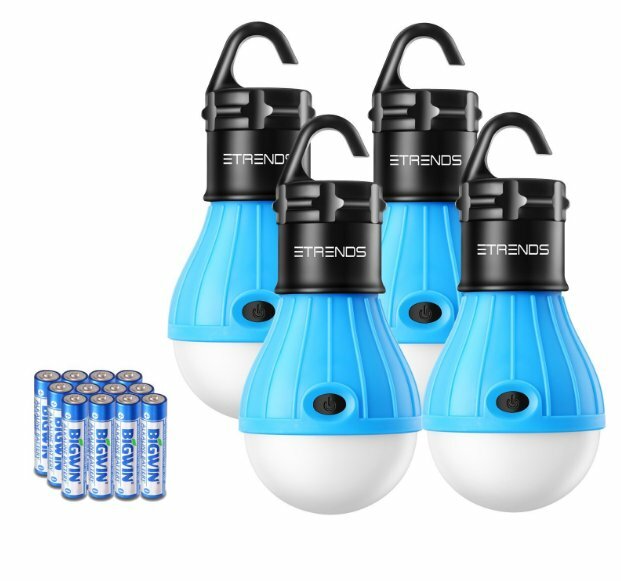 These handy, and admittedly kind of cool looking bulb “lanterns” from E-TRENDS are super handy for any outdoor activity. These bright LED bulbs hang anywhere and run off batteries. Hang in the tent, under the tarp, over the picnic table, or in the trees. Take with you anywhere — especially useful for that late night call of nature! Hang in the outhouse or on a branch for hands free lighting. Light, cheap, and safe enough for everyone to carry their own from dusk to dawn, in order to feel safe. 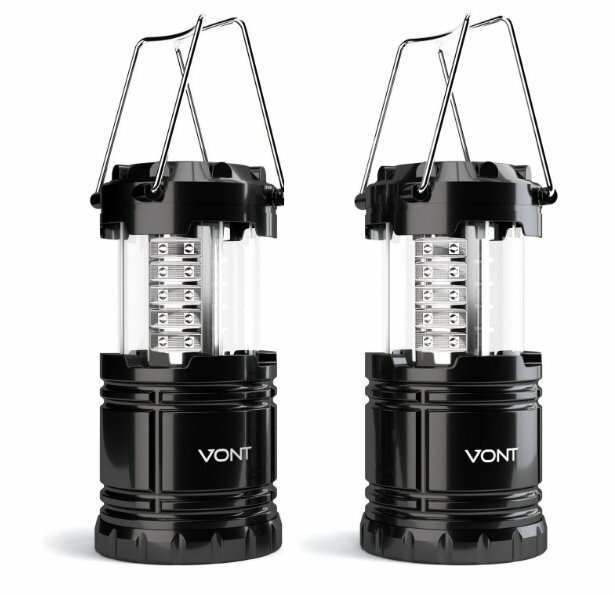 These super bright Vont lanterns feature 30 individual LED bulbs for 360 degrees of excellent illumination. Military grade construction stands up to abuse.High-efficiencyy design provides long-lasting wear. Collapses to about 4 inches to turn on. Push into the housing to turn off. As simple as that. No more fumbling in the dark to find the on/off switch. If you’re an established camper and plan to be hitting the trails on a regular basis, you’ll want to make sure you can do it in style and comfort. The camping supplies Amazon offers range from seating, folding tables, hammocks, and more to create all the comforts of home. Check out these lounging options. 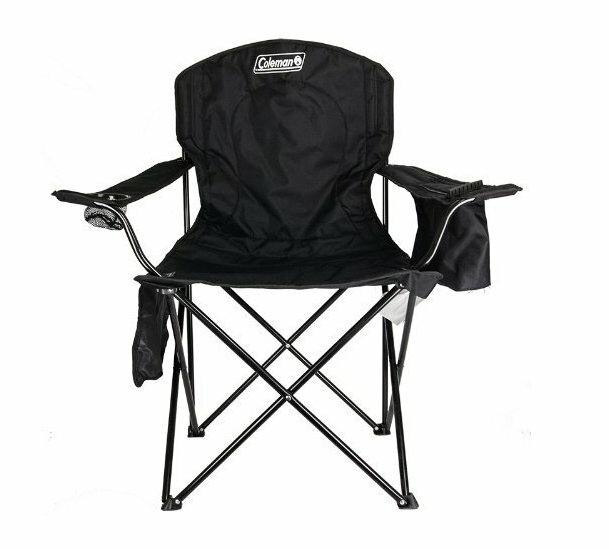 Pick your favorite spot in the shade, by the campfire or the lack, and relax for hours with this super sized Coleman camping chair. 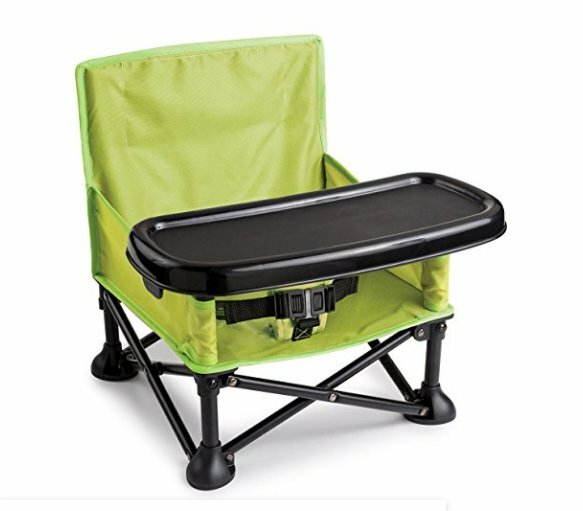 This camping chair has a convenient built-in cooler that keeps cold drinks at hand. Has a cushioned seat and back for sheer comfort. Folds and stores easily for transport or easy storage. 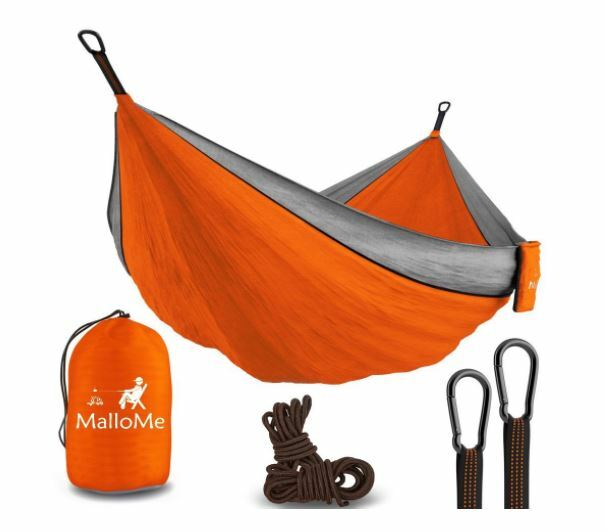 Just cuddle and chill with this double-sized parachute hammock. Measuring 125 by 79 inches, it fits two adults comfortably. The unique strap design holds up to 1,000 pounds. It’s super light and rolls up to the store in the attached storage back. Unfolds in seconds and includes strong carabiners and rope for easy setup. 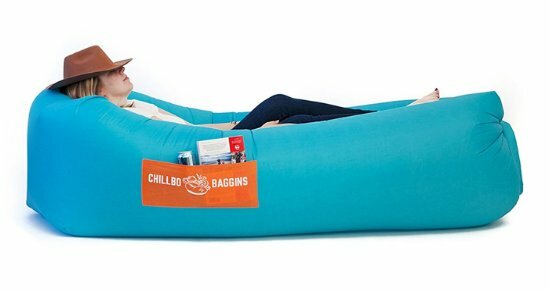 This Chillbo Baggins inflatable lounger has a handy pocket for your stuff. The design ensures complete relaxation, as it scoops you up and floats you on air. Better, yet, it also doubles as a water float for pools or the lake. Easy to inflate, no pump required. Just two “scoops” of air does the trick. The RV lifestyle is filled with carefree days of travel from one beautiful part of the country to another. It’s a lifestyle that many Americans look on with envy. It doesn’t matter if you’re a retiree living the lifestyle all year round, or just the lucky owner of a camper for family vacations. One of the benefits of the RV life is having everything at hand, with no expensive hotels or restaurants. 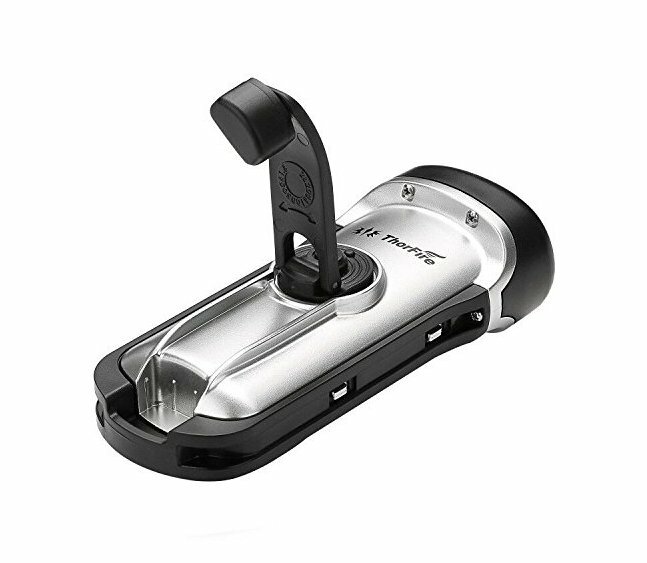 Up your RV game with some of these useful gadgets for RVers from Amazon.. 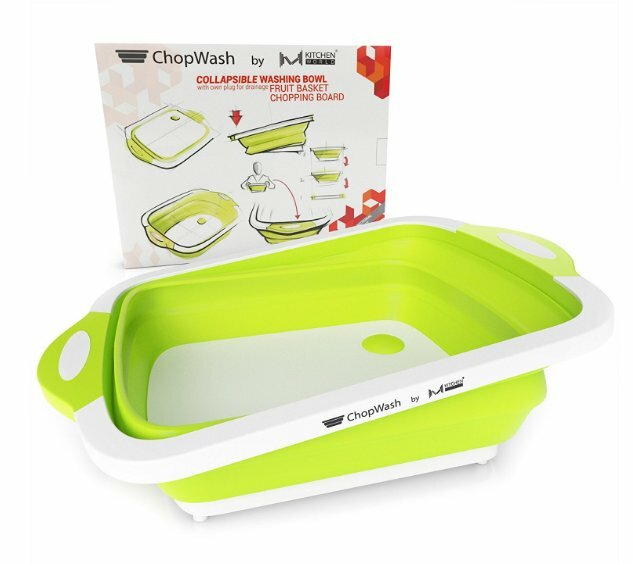 This handy ChopWash tub collapses to become a sanitary cutting board. It also doubles as an ice bucket. Use for washing up dishes, utensils, or fruits and vegetables. Has a drain plug in the bottom. Measures 15.75 inches long by 11.8 deep, and is 5.5 inches tall when fully opened. Saves space by collapsing to just 2 inches high to take up less space in your RV galley or camp kitchen. Made with BPA-free plastic and silicone rubber. Resists odors and bacteria. 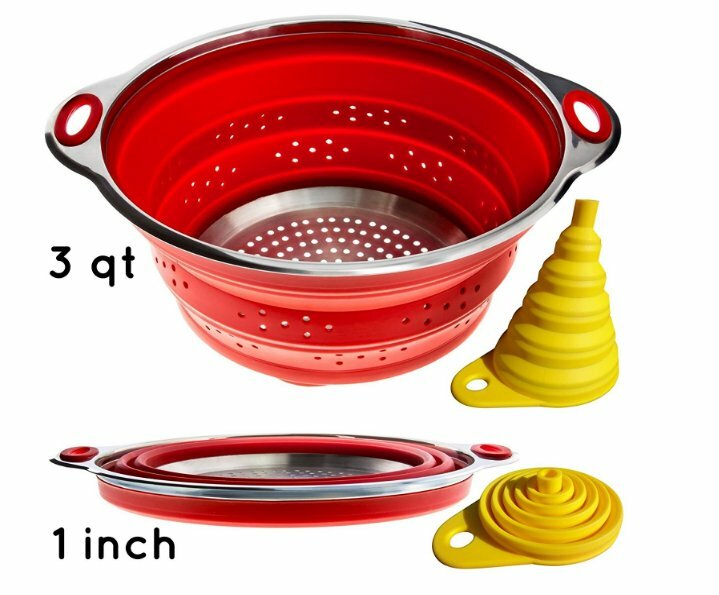 This collapsible colander and funnel set lets you cook like a pro chef on the road without wasting space in your RV kitchen. Colander capacity is 3 quarts and collapses down to just 1 inch tall for easy storage. Colander has stainless steel rim and bottom for rust-free durability. Dishwasher safe and heat resistant to 425 degrees Fahrenheit. 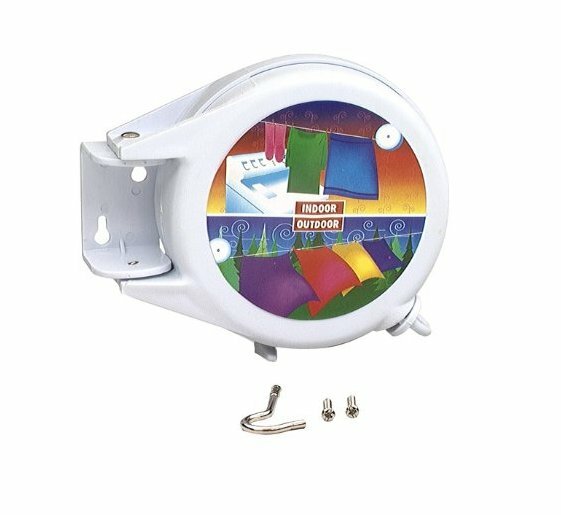 Dry or air out clothing and bedding anywhere with this retractable clothesline. Included hardware mounts to inside or outside of RV for 20 feet of line. Save money on laundromats, while keeping you and your RV fresh. These Cool-Shop LED motion detector lights provide extra security and visibility around your RV site. Easy to mount LEDs flash on when they detection motion. The wide angled design provides a large area of illumination. Solar panel means no batteries needed. They provide 800 lumens for security and safety: bright enough to see, not so bright they blind. Three modes of illumination provided: low light, motion detection, and full-on illumination. Waterproof and wireless with remote control up to 32 feet. Keep it with you when moving around the campground at night to help find your campsite. Be confident of pure, clean water wherever you go. 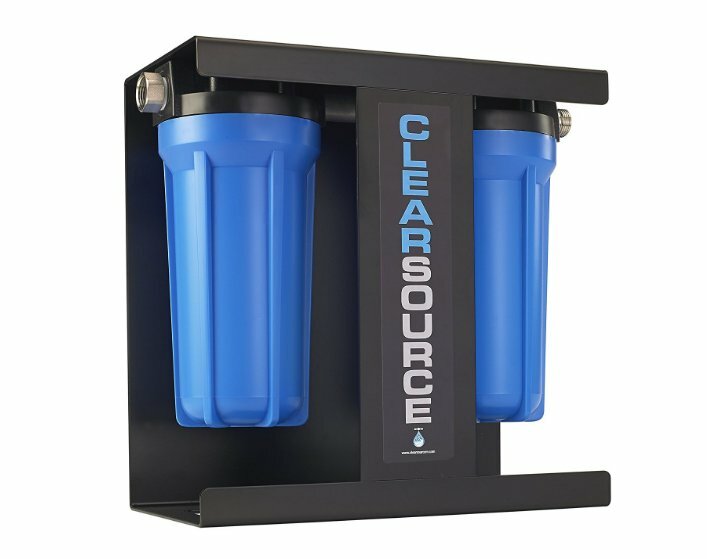 This premium Clearsource RV water filter system snagged the 2018 TrailerLife Magazine “Gear Of The Year” Award. Rugged powder-coated metal chassis stands up to the rigors of the road. Easy to hook to your water source. Removes chlorine, organic compounds, sediment, and other impurities from your drinking water. These study stepping stones from Camco help keep your RV clean and dry. Place around entrances and patio areas for dirt free locomotion around the site. Lay down around water spigots to keep mud off your feet and water containers. 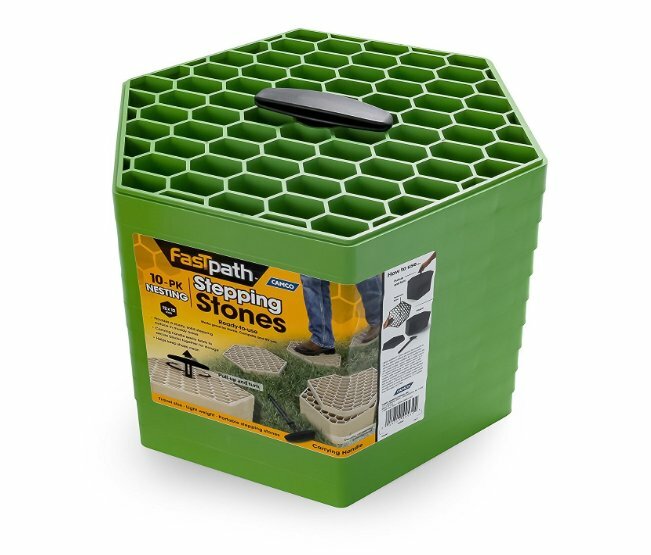 Makes a great step stool, too.. Cut out design makes them easy to clean. Stacks on carry handle for storage. Each of the 10 “stones” is 14 x 12 inches. Camping with babies might seem impossible, but Amazon’s got you covered with a wide range of baby items for outdoor living you might never expect. As long as you can keep baby clean, dry, fed, and protected from sun and insects, there’s no reason to wait till she’s older for your family camping trip. 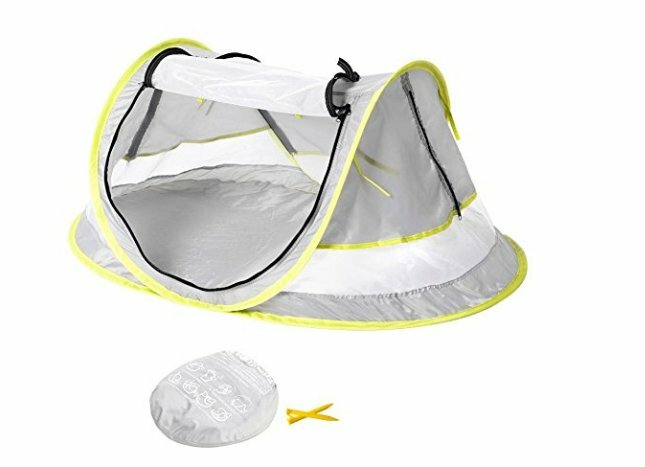 This fully netted travel tent for babies provides SPF 50 sun protection. Ultralight construction means it’s easy for carrying and weights less than a pound. . Mesh siding allows proper ventilation while keep bugs off baby. Anchor straps keep tent securely in place on ground or sand. The opened tent is 41.3 inches long by 26 wide, by 19 inches high. Plenty of room for infants and toddlers. Everyone knows that babies can make quite a mess. Along with the trouble they have hitting their mouths with the spoon, they tend to generate a lot of mess in their diapers. 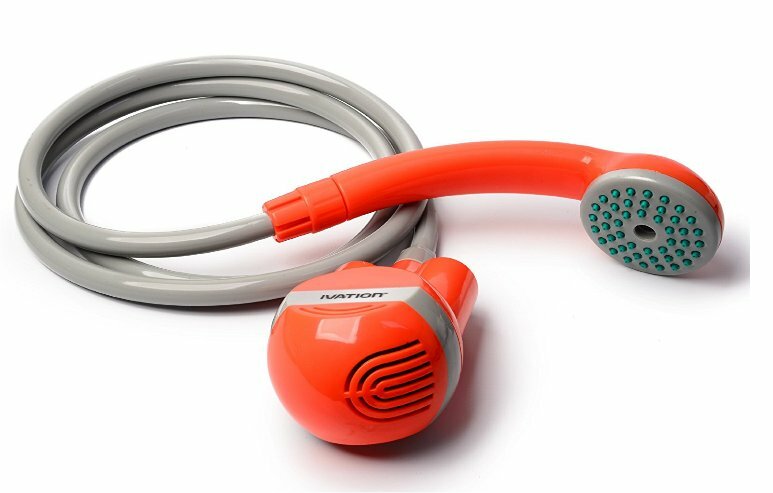 Turn a simple bucket of warm water into easy bathtime for baby with the Ivation portable shower. Battery powered pump provides a pleasant and effective spray of water. Recharges with USB and car adapter, too. So much safer than trying to bathe baby in your arms in the public campground shower. 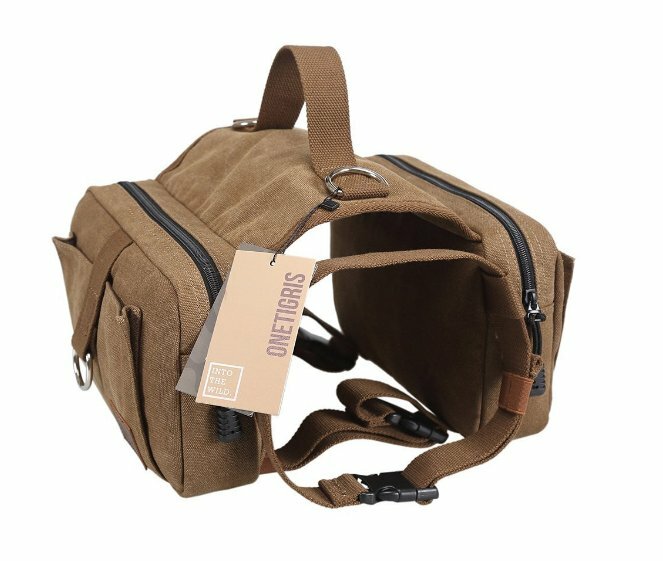 This cotton canvas backpack for dogs has a vintage look and is designed for comfort. The high density canvas features strong stitching for durability. Two zippered compartments with extra pockets distributes weight and makes it easy to store extra stuff for your pet. Bring your beloved dog along camping with this three-piece travel pet feeding set. Includes one food container, one water dish, and one food dish. The heavy duty canvas containers with waterproof lining collapse to save space. Made with non-toxic food safe materials. 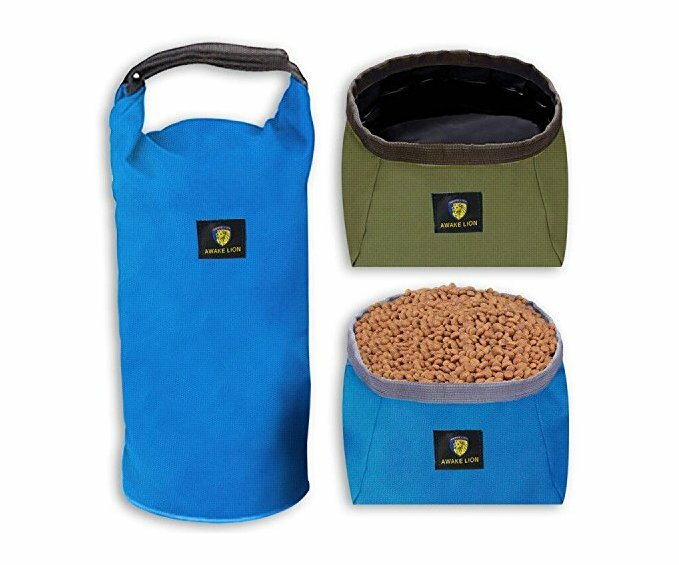 The Food bag has a five liter capacity (can hold up to 30 cups of dog food!). If you’re a complete newbie to camping with absolutely no equipment to get started, take a look at some of the complete sets of camping gear on Amazon. These sets provide all the basics in one. They usually include a tent, tarp, and poles, along with sleeping bags, camping chairs, and a lantern. They range in size from two to six people, which means the tent fits that many sleepers. You can generally get the full kits for a much lower price than if you purchased them separately. Keep in mind, you may still need to purchase additional items. The perfect starter camping kit from Stansport. 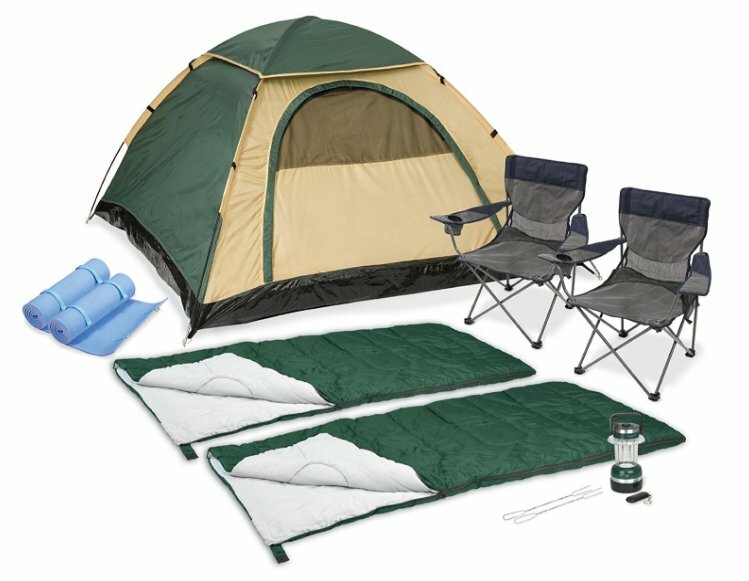 Great for couples or scouts, this two-person set includes tent, lantern, two sleeping bags, two water resistant sleeping pads, and two foldable camping chairs with cup holders. 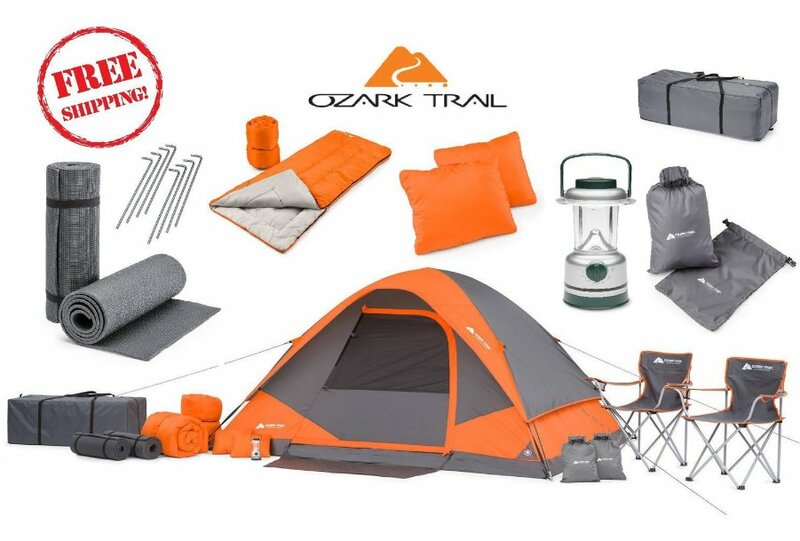 This 22-piece camping set by Ozark Trail includes a four-person tent with stakes, two sleeping bags and pads, and an LED lantern. Includes two camp chairs, storage bags, and more. 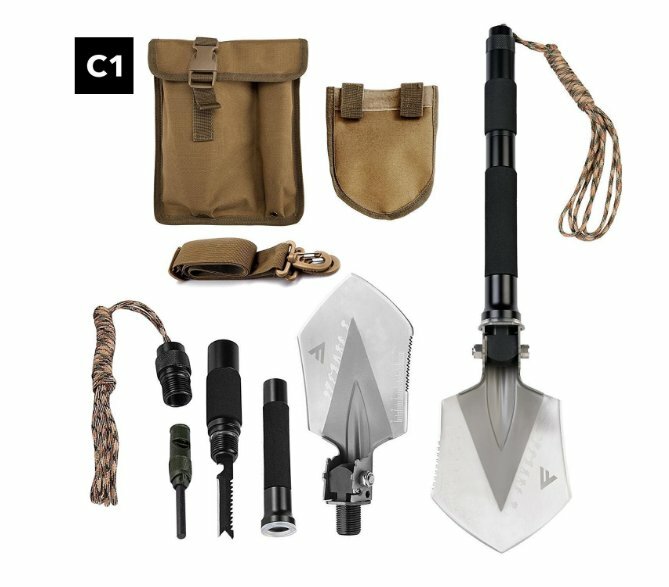 A great little starter set for new campers. 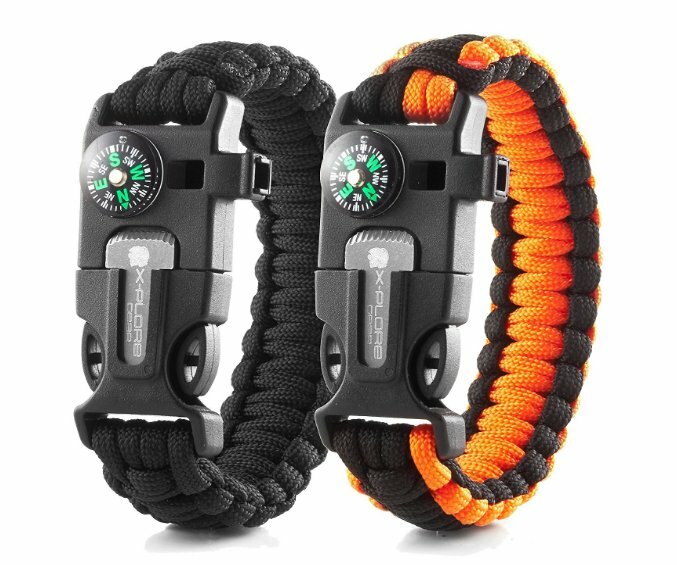 This attractive paracord bracelet with compass makes a nice gift for scouts and hikers. 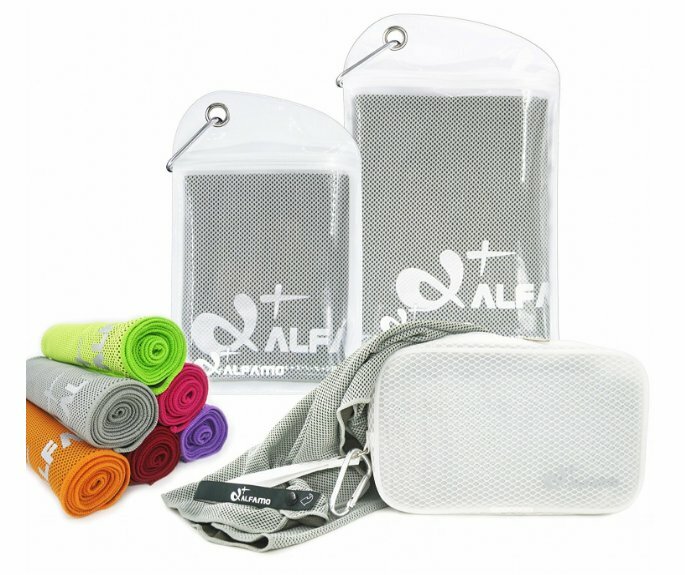 Hiking the trail can get hot, but not with this Alfamo cooling towel. This hyper-evaporative mesh chills instantly. Soak to activate, then wring it out. Stays chilled up to three hours and reduces body temperature when worn around the neck. Also provides 50 SPF sun protection. Comes with a waterproof case to stay chilled until you need it. Case has a clip to attach to your backpack or bet. Awesome gift for hikers, campers, and even gardening enthusiasts. 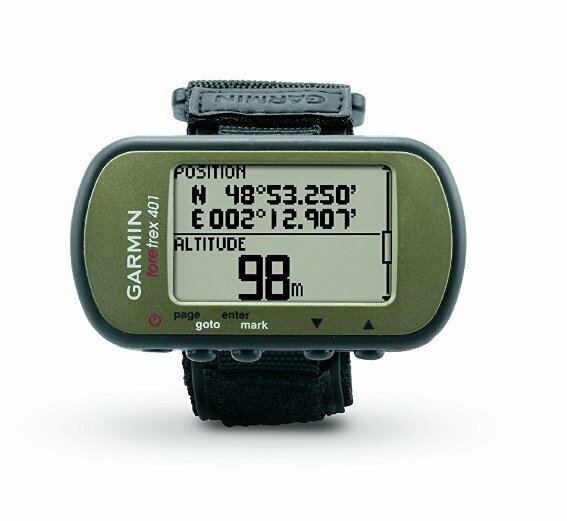 Never lose track of your loved ones again when they have this handy Garmin GPS to take hiking with them. Garmin is the name in GPS, and this highly sensitive device has excellent reception whether under heavy tree canopy or deep in the canyons. Keeps track of your route, and retrace your steps on the LCD display. Trip computer includes sunrise and sunset times, hunting and fishing information, compass, and altimeter. 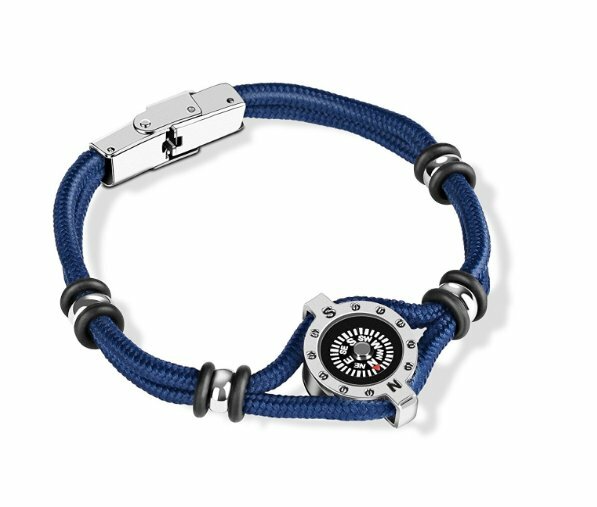 These cool paracord bracelets are like a survival kit with style. Contains flint fire starter, whistle, scraping knife, and compass, Be prepared anywhere whether hiking, fishing, or camping, with these durable four-in-one utility bracelets. 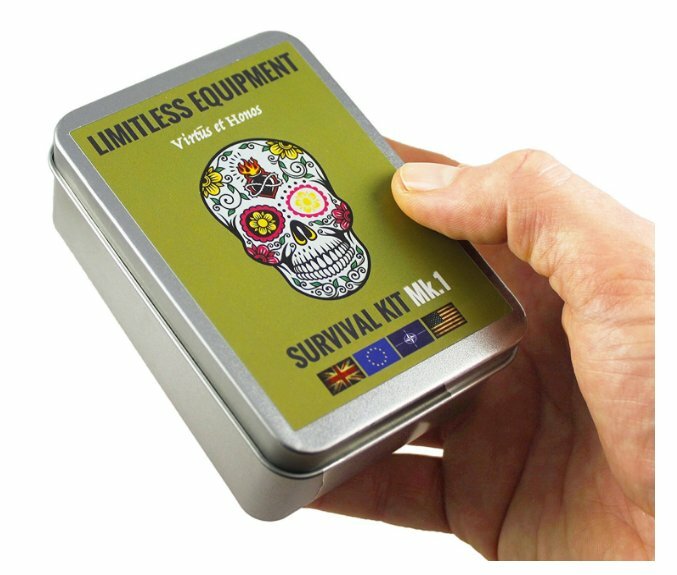 This is a complete emergency and survival-kit is the perfect size to take camping and contains 40 essential items. Includes LED lamp, compass, light sticks, fishing kit, fire starter, water carriers and filters, first aid kit, and more. Hike anywhere free of worry. No matter where you end up, you’re sure to live through it. This handy survival kit makes a great gift for your favorite hunter, hiker, or camper. 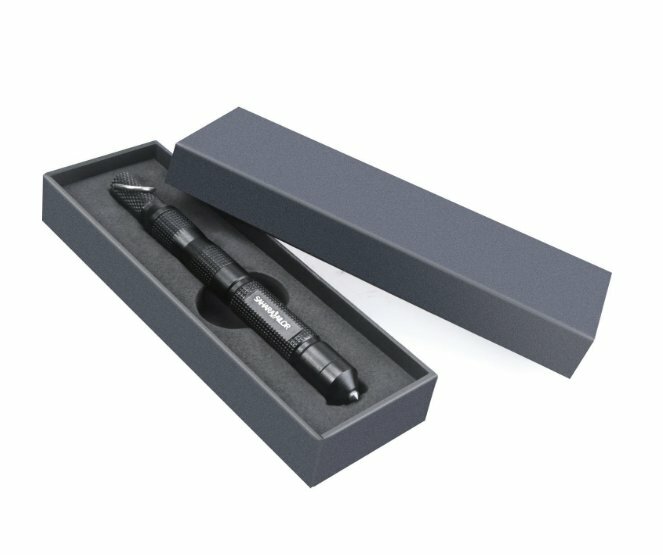 Contains 11 great tools in one little box: flint stone, scraper, flashlight, Swiss card, mini light, compass, tactical knife, whistle, tungsten steel pen, and an emergency blanket in a tidy box. 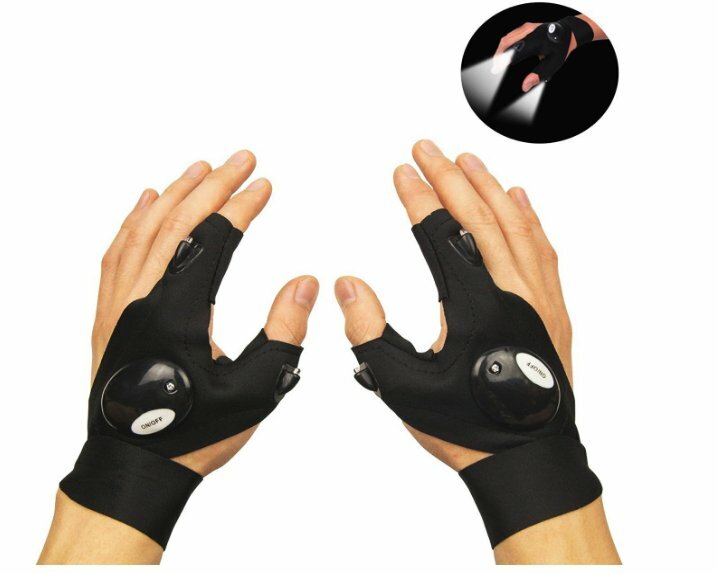 These fingerless flashlight gloves let you work on any task in the dead of night. Comfortable breathable fabric stretches to fit. Easy to turn on and off. Great for middle-of-the-night tent repairs (or snack box raids). 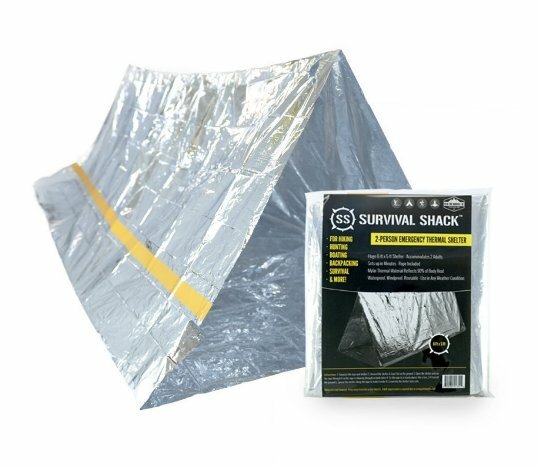 Secure your tarp and rain fly in the dark. Keep a pair in your car or truck at all times for late-night tire changes or vehicle repairs. A great outdoor gadget for the scout, this folding shovel comes in handy for camping trips. Use to chop wood, dig fire pits, create trenches to draw water away from the campsite, or peel bark for kindling. Handle contains a magnesium rod for fire starting and a knife. This shovel folds and stores in the included canvas bag to stay clean, dry, and sharp. 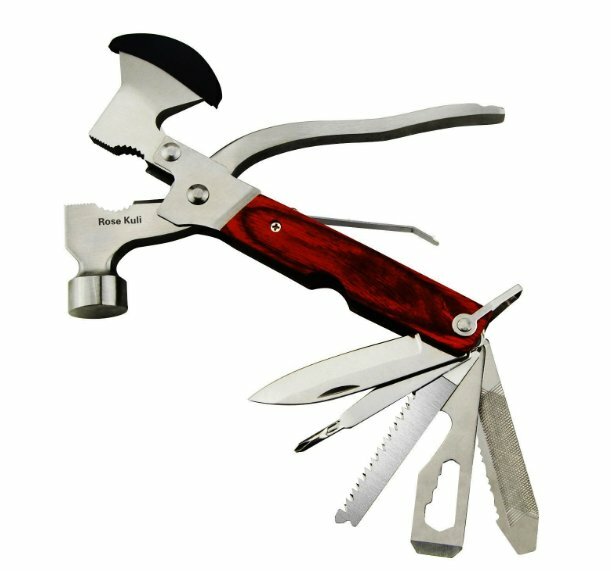 This is an amazing gift for your favorite camper, because it can be used at home or in the woods. 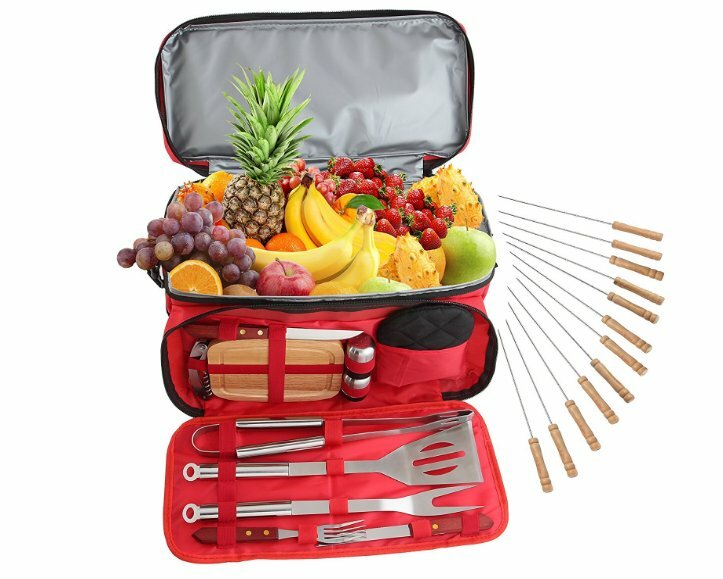 This high quality stainless steel barbecue set has all the tools you need to cook on the grill or over the fire. Also included are cutting board, salt and pepper shakers, oven mitt, and cooler bag. Camping is an American tradition, starting with the Native Americans who followed the bison herds, moving from place to place with the minimum of gear. The early immigrants from Europe learned to camp too, and headed across the country, through the prairies and over the mountains, looking for arable land. To this day, American wanderlust is just part of our culture and in our blood. From road trips down old Route 66 to the nomadic Renaissance Fairs, Americans love to hit the road and camp along the way. 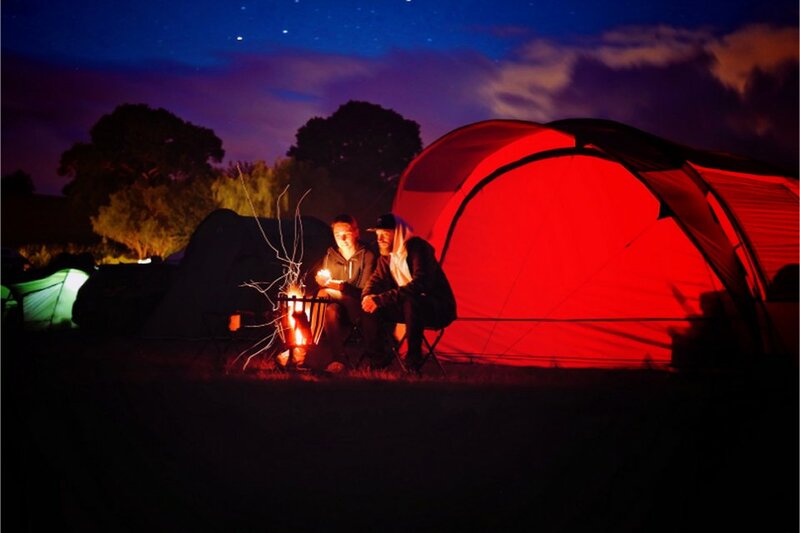 Camping is a great way for couples to spark romance and share adventure. It’s a wonderful way for families to make memories and have fun together. RV camping is still a retirement dream for many longing to see the country in their carefree years. Start your own family tradition with the best camping gear on Amazon and hit the road. You won’t regret it.